Achieving or maintaining beautiful skin can be simple. Our monthly memberships give you the opportunity to treat your skin routinely without a lot of downtime. You will receive quality skin care and products at a great price. Our goal is to provide great discounts while saving money to your account to be used on future treatments. 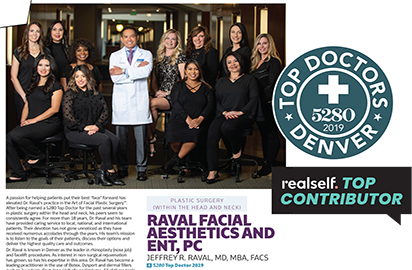 Double board certified facial plastic surgeon, Dr. Jeffrey Raval and his highly trained team have been proven through many awards including 5280 Top Doc 2016 & 2017. Your membership offers member only specials on Botox, Dysport, dermal fillers, laser and skin care treatments, and skin care products. We offer 3 great membership levels to meet your needs. You deserve to look and feel your best, and with these memberships make it more affordable. It’s simple, a credit card is charged monthly and that money is applied to your account for future use. All monies on your account can be used toward treatments or products, excluding surgery. Can I really tailor my benefits? Yes, you can choose any products or non-surgical procedures we offer, except PRP ("Platelet-Rich" Plasma) treatments. With ClubTOX® membership, you also get a discount on follow-up PRFM ("Platelet-Rich" Fibrin Matrix) treatments, after your initial treatment package. Unfortunately not, your discount and monies can only be used for your treatments and products. You can always encourage a friend to join, too – what a great way to inspire each other to keep your skin healthy and youthful-looking! There is a 3-month membership minimum. After that, you may cancel with a 30-day notice in writing or via email. You can use any remaining credit toward future treatments, but club discounts will no longer apply. How will I know about special offers? You’ll receive email notifications and reminders about our membership specials. The monthly membership fee is charged and monies applied to your account. There are no initiation or annual fees.